A dear friend lost her husband unexpectedly yesterday. I got the message late last night and when I returned the call, I discovered that sympathy and compassion were not the only emotions to come to the fore. As travel plans were discussed, some weighed and other forcibly abandoned for work obligations, I felt stymied. Frustrated that I couldn’t be with my friend and irritated that professional demands have taken the place of flesh and blood relationships. Why couldn’t I just put everything on hold and fly across the country to be at her side? Wouldn’t my clients, employers and colleagues understand and grant me the wide berth that death requires? Haven’t they all experienced the crunch that time imposes upon the meandering of emotion? Who has ever successfully reined it in? After the call, I showered and got ready for bed. That’s when the serious fretting began. As the water pounded my back, I knew that something or someone would invariably suffer, no matter what my decision. Work, if I chose my friend and my friend, if I chose work. Suddenly, a surge of anger passed over me. Are these the days when peers are slowly lost? Why must all our meetings be in funeral parlors instead of sunny beaches where we laugh over old memories? Do we care so little for each other that we can’t make time to share what time we have left? I imagined what it would be like to have the old gang together, older but still good-humored, sipping cocktails around a roaring fire at the Dunes, laughing in the carefree way we espoused in youth and hang onto today in defiance. I couldn’t help but smile to myself, seeing their faces in my mind’s eye, and I felt buoyant. Irritation washed down the drain with the rest of the suds and I realized why we meet in sorrow: Joy is easy; it gives one wings, but grief is hard to bear alone. After observing a few high-profile individuals as well as some friends succumbing to the temptations of regression, I began to wonder what prompts a reasonable person with goals and ambition to start looking backward? Do they come to a crossroads and the assessment sends them into a tailspin? Is it a form of mid-life crisis? What is it about the future that makes one so squeamish? It could be our over-reliance upon youth. None of us really think we’ll get any older; it’s just a distant notion that seems unrelated. Sure, we have elderly family members and neighbors, but who among us actually consider that age, and all that it conjures, is our lot as well? It’s usually just dismissed, like a disease that can be prevented with exercise and nutrition. However, despite your best efforts to stave it off, it always shows up. Maybe we’re just afraid of death. We see the landmarks along the way and delude ourselves by thinking that removing or altering them will cheat the outcome waiting at journey’s end. How many people have you seen suddenly reverting to high school behavior, oblivious to its effect? Maybe we laugh at the balding guy in the red convertible, but to him, he’s actually re-living the thrill of adolescence. And so is the nip-and-tucked matron running around with her young boyfriend. As long as their minds are occupied with pleasant distractions, they don’t have to face the inevitable. It will come nonetheless. You can go gracefully or kicking and screaming, but go you must. Even the most stubborn middle-aged toddler eventually realizes this. The tantrums and willfulness only work when the parent can be manipulated. 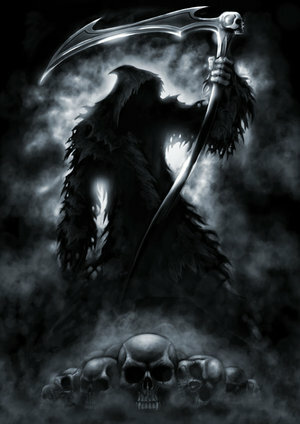 I don’t think the Reaper is that easily persuaded.